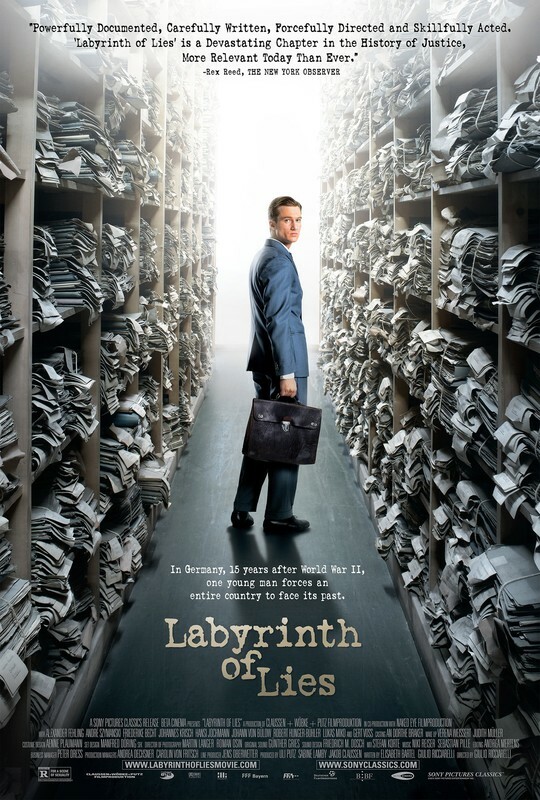 It is telling that 2014's Labyrinth of Lies was selected as Germany's entry for the Oscar for Best Foreign film. In a neatly laid-out manner it covers an "important" issue, of the 1963 German home-grown trial of former Nazis for their concentration camp atrocities, appeals to emotional heartstrings with writing and musical score cues that in no uncertain terms tell you what you must feel and also aims for mainstream appeal with its handsome Dicaprio-esque leading man Alexander Fehling. Fehling plays enthusiastic young lawyer Johann Radmann, a fictional composite of public prosecutors involved in the case, while making a pivotal but ultimately supporting character of Fritz Bauer, who conceived and spearheaded the legal onslaught to expose and lance the festering sore many Germans would prefer to have forgotten (Bauer is also supposed to have passed on crucial information to Israel that led to the capture of Holocaust architect Adolf Eichmann). In the film Radmann is eager to prove himself with more worthy cases than the traffic violations assigned him. 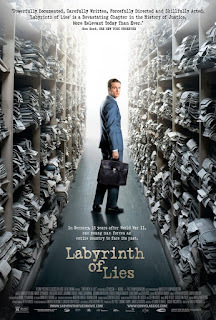 He picks up the trail of a school teacher identified by as an SS officer by a camp survivor, and is encouraged by Attorney General Bauer (Gert Voss). Radmann digs deeper to unearth a mass machinery of torture and murder that many ordinary Germans of the time were aware of, and complicit in deed. People exposed to Allied accounts of the Nazi evil will find nothing here that's new or shocking (the Nuremberg trials were held immediately after WW2 ended), but the German public remained for a long time in a state of shock and denial about the actions of their own government and people, of what crimes against humanity had been committed in the name of "following orders". Radmann carries out interviews with survivors and pores over several directories worth of documents to identify former Nazis associated with the camps. His investigation faces resentment and opposition, from his own colleagues and from forces in high circles. But with Bauer's support and encouragement he brings the case to trial, which is where the film ends. LoL (an unfortunate abbreviation) is very clear-cut and sanitized, too much so to have much impact (at least for a non-German who doesn't have that kind of personal resonance with the issue itself). Compare this to David Fincher's Zodiac, which covered a far smaller scope (lone killer, half dozen victims) but with sufficient detail and layering for us to empathize with the emotional toll on the characters and see them as three-dimensional beings. Here, both victims and perpetrators are mostly cogs in the story machine for us to see the struggle and eventual victory against odds of the haloed hero (the latter are particularly flat, even the teacher is shown to harshly address a pupil just before he is arrested). There is also a romance with a pretty dress-maker, and a lover's tiff when he tells of her father's involvement in Poland. This is not exploration of a searing issue, this is HBO Movie of The Week. Perhaps I'm being unkind. Perhaps this is the sort of film that needs to be made first, to allow people at large to accept this part of their history before they are ready for more studied works. LoL works well at that, but it is not by any means a great film in itself.